Panama Canal construction in 1913 showing workers drilling holes for dynamite in bedrock, as they cut through the mountains of the Isthmus. Steam shovels in the background move the rubble to railroad cars. It was the greatest infrastructure project the world had ever seen. 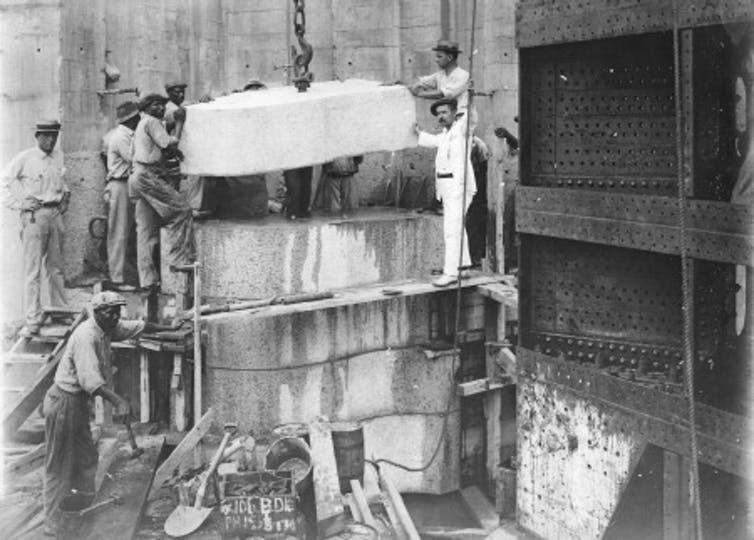 When the 77 kilometre-long Panama Canal officially opened in 1914, after 10 years of construction, it fulfilled a vision that had tempted people for centuries, but had long seemed impossible. “Never before has man dreamed of taking such liberties with nature,” wrote journalist Arthur Bullard in awe. But the project, which employed more than 40,000 labourers, also took immense liberties with human life. Thousands of workers were killed. The official number is 5,609, but many historians think the real toll was several times higher. Hundreds, if not thousands, more were permanently injured. How did the United States government, which was responsible for the project, reconcile this tremendous achievement with the staggering cost to human lives and livelihoods? They handled it the same way governments still do today: They doled out a combination of triumphant rhetoric and just enough philanthropy to keep critics at bay. From the outset, the Canal project was supposed to cash in on the exceptionalism of American power and ability. 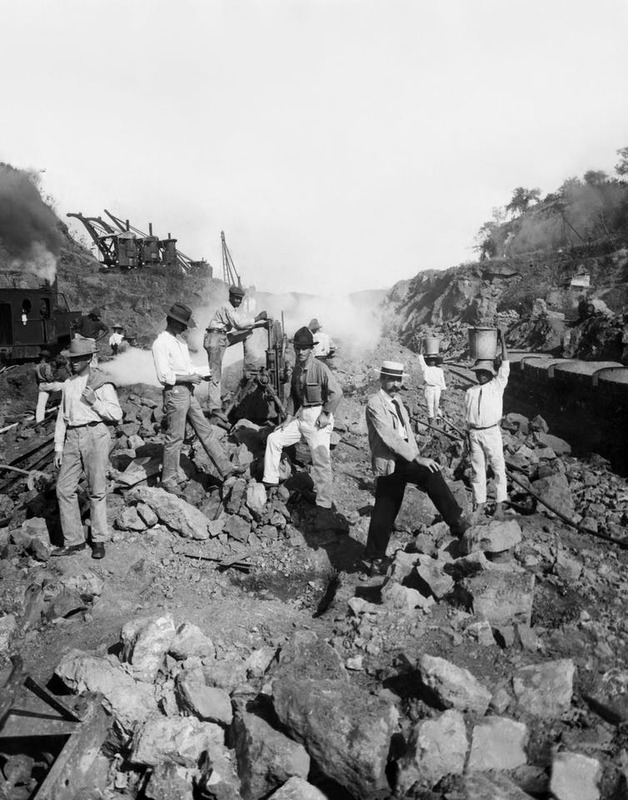 Work crew drilling through solid rock to create the Panama Canal, Panama, 1906. The French had tried — and failed — to build a canal in the 1880s, finally giving in after years of fighting a recalcitrant landscape, ferocious disease, the deaths of some 20,000 workers and spiralling costs. But the U.S., which purchased the French company’s equipment, promised they would do it differently. First, the U.S. government tried to broker a deal with Colombia, which controlled the land they needed for construction. When that didn’t work, the U.S. backed Panama’s separatist rebellion and quickly signed an agreement with the new country, allowing the Americans to take full control of a 16 kilometre-wide Canal Zone. But this was just the beginning. The world’s largest dam had to be built to control the temperamental Chagres river and furnish power for the Canal’s lock system. It would also create massive Gatún Lake, which would provide transit for more a third of the distance between the Atlantic and Pacific oceans. The destruction was devastating. Whole villages and forests were flooded, and a railway constructed in the 1850s had to be relocated. The greatest challenge of all was the Culebra Cut, now known as the Gaillard Cut, an artificial valley excavated through some 13 kilometres of mountainous terrain. More than 100 million cubic metres of dirt had to be moved; the work consumed more than eight million kilograms of dynamite in three years alone. Imagine digging a trench more than 90 metres wide, and 10 storeys deep, over the length of something like 130 football fields. In temperatures that were often well over 30 degrees Celsius, with sometimes torrential rains. And with equipment from 1910: Dynamite, picks and coal-fired steam shovels. 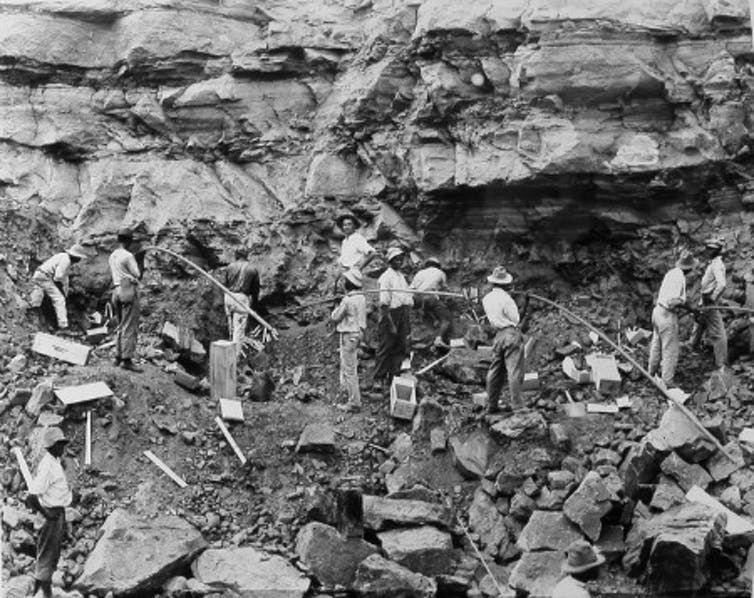 Loading shot holes with dynamite to blast a slide of rock in the west bank of the Culebra Cut, February 1912. The celebratory rhetoric masked horrifying conditions. They lived like second-class citizens, subject to a Jim Crow-like regime, with bad food, long hours and low pay. And constant danger. In the 1980s, filmmaker Roman Foster went looking for these workers; most of the survivors were in their 90s. Only a few copies of Fosters’s film Diggers (1984) can be found in libraries around the world today. But it contains some of the only first-hand testimony of what it was like to dig through the spiny backbone of Panama in the name of the U.S. empire. Constantine Parkinson was one of the workers who told his story to Foster, his voice firm but his face barely able to look at the camera. He started work on the canal at 15 years old; like many, he may have lied about his age. He was soon a brakeman, probably on a train carrying rocks to a breakwater. On July 16, 1913, a day he would never forget, he lost his right leg, and his left heel was crushed. Goethals was only partly right. At the outset, the U.S. government had essentially no legislation in place to protect the tens of thousands of foreign workers from Barbados, Jamaica, Spain and elsewhere. Administrators like Goethals were confident that the labourers’ economic desperation would prevent excessive agitation. For the most part, their gamble worked. Though there were scandals over living conditions, injuries seem to have been accepted as a matter of course, and the administration’s charity expanded only slowly, providing the minimum necessary to get men back to work. A. A. 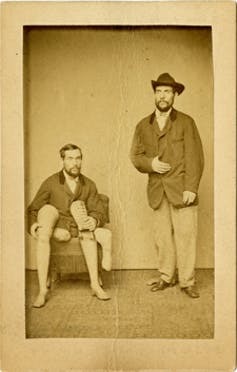 Marks advertising card, showing a customer holding and wearing his artificial legs, late 1800s. There were, however, caveats to this administrative largesse: the labourer could not be to blame for his injury, and the interpretation of “in the performance of … duty” was usually strict, excluding the many injuries incurred on the labour trains that were essential to moving employees to and from their work sites. Despite all of these restrictions, by 1912, A.A. Marks had supplied more than 200 artificial limbs. The company had aggressively courted the Canal Commission’s business, and they were delighted with the payoff. A.A. Marks even took out a full-page ad for their products in The New York Sun, celebrating, in strangely cheerful tones, how their limbs helped the many men who met with “accidents, premature blasts, railroad cars.” They also placed similar advertisements in medical journals. But this compensation was still woefully inadequate, and many men fell through its deliberately wide cracks. Their stories are hard to find, but the National Archives in College Park, Md., hold a handful. I have ben Serveing the ICC [Isthmian Canal Commission] and the PRR [Panama Railroad] in the caypasoity as Train man From the yea 1906 until my misfawchin wich is 1912. Sir without eny Fear i am Speaking Nothing But the Truth to you, I have no claim comeing to me. But for mercy Sake I am Beging you To have mercy on me By Granting me a Pair of legs for I have lost both of my Natrals. I has a Mother wich is a Whido, and too motherless childrens which During The Time when i was working I was the only help to the familys. You can still hear McDonald’s voice through his writing. He signed his letter “Truley Sobadenated Clyante,” testifying all too accurately to his position in the face of the Canal Zone’s imposing bureaucracy and unforgiving policies. With a drop in sugar prices, much of the Caribbean was in the middle of a deep economic depression in the early 1900s, with many workers struggling even to reach subsistence; families like McDonald’s relied on remittances. But his most profound “misfortune” may have been that his injury was deemed to be his own fault. Legally, McDonald was entitled to nothing. The Canal Commission eventually decided that he was likely to become a public charge without some sort of help, so they provided him with the limbs he requested, but they were also clear that his case was not to set a precedent. Other men were not so lucky. Many were deported, and some ended up working on a charity farm attached to the insane asylum. A few of the old men in Foster’s film wipe away tears, almost unable to believe that they survived at all.